Henrik Fisker, who's designed famously sensual cars for Aston Martin and BMW, has said he'll have a $40,000 electric SUV built by 2021, less than a year later than Elon Musk has promised his freshly unveiled Model Y will hit the road. Monday's announcement came as a surprise. The Aston Martin DB9 and BMW Z8 designer had previously announced plans to produce an expensive electric sports car instead. But in a phone interview, Fisker says he's evolved since 2012, when he released the now discontinued $100,000 Fisker Karma (and its warmed-over corpse, the Karma Revero). After an initial 2008 debut and prolonged hiatus until production started in 2011, the lugubrious hybrid-electric sedan received middling reviews (famously breaking down during Consumer Reports testing) and complaints from owners about reliability and craftsmanship. It sold fewer than 1,800 units nationwide. Fisker says that "lessons learned" since then indicate it's better to sell a more versatile, more affordable SUV before moving on to a ritzy sedan. "This time we wanted to go directly to a volume segment where we can have a long-term business where you can actually make money," he says, noting that while sedans have likely peaked, SUVs remain the fastest-growing market in the world. By 2022 more than 65 percent of new-vehicle sales will be pickups and SUVs. "It's about partnering in the right places, not spending hundreds of millions where you don't have to. Now I have this experience and lessons learned and have figured out what is the best way to do this." Indeed, tracking the array of companies and projects where Fisker and his collaborators have spent millions is dizzying. As far back as 2007, and after what by all accounts are considered brilliant years at Aston and Jaguar — including consulting with Tesla to produce some initial designs of the Model S — Fisker styled the Artega GT two-door sports car for a German company called Artega Automobile. That car was produced for just three years, from 2009 to 2012, to indeterminate sales. The confusing list of brand names, corporate entities, and car models has characterized the Dane in recent years, as he's also designed yachts with Benetti, developed a lifestyle brand of T-shirts and posters, dabbled in motorcycles and Mustangs, and built other automobiles with ex-Boeing executives and General Motors' Bob Lutz under the name VLF Automotive. It's a level of proliferation that will likely hurt rather than help the case for his latest declaration of intent. "His past problems mean there's a huge lack of momentum and credibility in the industry, in terms of what he can deliver on," says Tim Urquhart, the principal automotive analyst at IHS Markit. "He's already said he's going to build a new sports car, now he's turning around and saying the SUV will be first. The electrification looks impressive," Urquhart says, "but again, you need to deliver on these vehicles. We've already had a couple false starts." The as-yet-unnamed SUV would come from a new corporate entity called Fisker Inc. Fisker says it will use an 80-kilowatt-hour lithium ion battery pack, two electric motors, and optional four-wheel drive for a range of 300 miles on one charge. It will come with variants, including one tentatively called the "California Edition" that sheds its walls and top to open up like a Jeep -- but does so at the push of a button. A drivable prototype will be finished by the end of 2019, he says. Henrik Fisker released an early look at a planned all-electric luxury vehicle Monday. He calls it a futuristic, elegant muscular EV with clean surfaces, dramatic shape and design touches that have been traditionally found on supercars. The California-based company is now just one of many automakers to promise a fully electric SUV. Audi and Jaguar are already selling them. BMW and Mercedes-Benz will offer them for sale by next year. And Tesla has one now, the $82,000 Model X, and one in the hopper, the just-announced Model Y, which happens to start at $39,000. "We felt now was a good time to announce this, now that Tesla showed their cards," Fisker said. 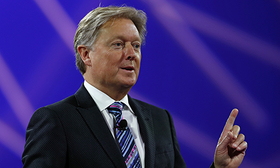 Kevin Tynan, the senior autos analyst for Bloomberg Intelligence, characterized Fisker as a man who has had great success and some near misses in the auto industry. But Tynan compared the latest endeavor to Fisker "taking off his track suit while all the other volume players are already running the race." Fisker has yet to secure a factory for the 200,000 SUVs he says he'll build annually by 2025. 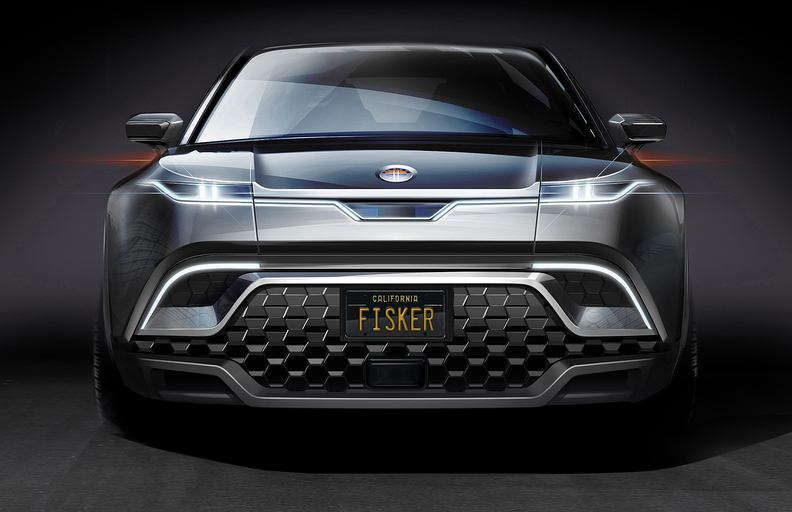 (Fisker said he is currently in discussion with locations in five different states.) What's more, Fisker's promise that the new business will be profitable in its first year, with "double-digit growth built into the business model," would propel the company to unheard-of success relative to any startup today. It requires hundreds of millions for an OEM to develop, produce and scale any new road-worthy and -- legal vehicle in the U.S., not to mention near billions to do it from a total startup standpoint. Tesla required years to become even briefly profitable. Many startups are not profitable in their first year -- or ever. "At least with Elon, sometimes the timelines are a little bit hazy, but he has always pretty much delivered pretty soon after," Urquhart said. "Eventually Elon gets there. Henrik needs to eventually get there. He needs to show the industry, show customers, show the world, that he can do it." Fisker's new business plan will see the company sell SUVs online, augmented by experience stores in cities across the country -- mirroring Polestar's playbook, which itself is based off Tesla's. He also promises a potential network of 1,000 service centers with techs trained to provide maintenance and repairs to all kinds of electric vehicles nationwide. He said the expense of producing the SUV is "less than half of what it cost the first time around to do this" -- that he's saving money by choosing additional and strategic partners (he declined to say whom), reducing spending on marketing, and by benefiting from the general advancement in the automotive industry for electric batteries and related components. For some of that, he even had archrival Tesla to thank. "When Fisker and Tesla started, we had to do everything ourselves, whether we liked it or not," Fisker said. "That was extremely expensive. Just generally we had to spend a lot more money with suppliers and in r&d. We were overcharged by all the suppliers. We had to pay for all of that stuff up front. Now you have suppliers which in the meantime have ramped up, and they have what we need. You don't have to go out up front and pay for all this tooling." Fisker knows the anti-story anyway -- he sees it as an advantage. "I've put a car on the road," Fisker said. "That's quite a big task -- not a lot of people actually get to that point. With the other startups, they don't have the lessons learned, they are just imitating Tesla and just burning through millions. I really took the lessons learned the first time around. At the end of the day, we need a sustainable business that makes money."